The GHE 3-part, mineral-based nutrient system was introduced many years ago and is still in use today by thousands of growers world-wide. General Hydroponics constantly conducts research and then updates it's products according to their findings on a regular basis. Flora Gro is designed to be used along with Flora Micro and Flora Bloom to make a complete nutrient. Using different ratios of each in different stages of growth produces a complete nutrient that's perfectly adapted to each part of your grow. 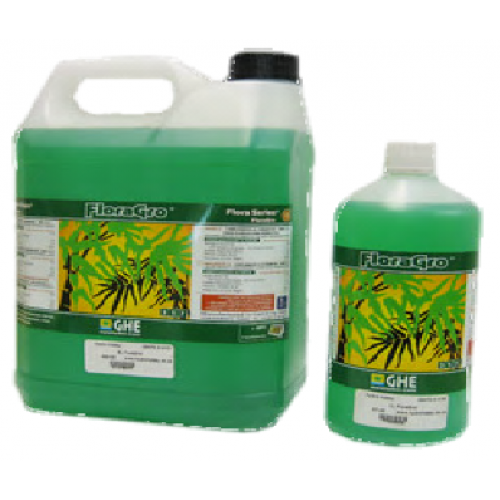 Flora Gro promotes lush structural and foliar growth. GHE Flora nutrients work perfectly in hydroponics, aeroponics and coco. GHE 3-part Flora nutrients also work well in soil but the strength should be approximately two thirds of that used in Hydroponic situations. Use GHE Flora Gro along with Flora Micro and Flora Bloom to make a nutrient solution that's perfectly tailored to the particular growth stage of your plants. Always shake the bottles well before use. Using the guide below, add the appropriate amount of each part to your reservoir, mixing well in-between adding each part. Adjust the strength of the solution to the recommended CF and then adjust the pH if necessary. We recommend that the nutrient solution is replaced every 7 days. A ‘forcing solution’, General Hydroponics Ripen is a late stage nutrient that can be used to speed u..